En masse, Republican primary voters may not be acting in the best interest of the party’s chances in the November election. Real Clear Politics tracks all kinds of polls, including how each GOP candidate does against the likely Dem nominee Hillary Clinton. John Kasich consistently polls higher than the other three candidates despite being fourth place in the current delegate count. Even though he has amassed the most votes, Donald Trump consistently loses to Clinton in a head to head match up. So when Donald Trump says Clinton doesn’t want to face him, I think he is overconfident. In current polling among Republicans, Trump leads, followed by Cruz, Rubio and Kasich. 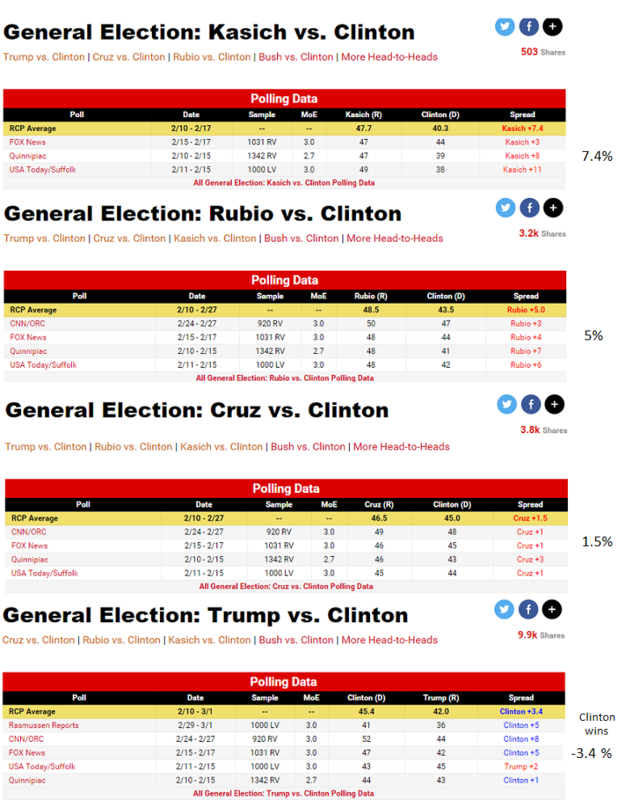 However, the same polls show Trump losing to Clinton with Kasich showing the largest winning margin over Clinton followed by Rubio, and Cruz. Pundits have been predicting last minute surprises in the South Carolina primary. This looks like an effort by the Cruz campaign — sorry I meant Barton’s Cruz Super PAC — to cast doubts on Rubio. It certainly sounds like there is a lot of coordination between the Super PAC and the campaign (e.g, door knockers paid for by the Super PAC). We also learn in this video that many Iowa pastors showed a Cruz video in church and urged people to vote for Cruz…just like Jesus exhorted us to do! Near the end of this segment, Barton says that many of Rubio’s supporters and donors are establishment gay marriage supporters. If personnel is policy, as Bryan Fischer said near the end of the clip, then folks concerned about dominionism, and the misuse of history and the constitution (Barton: the Constitution quotes the Bible verbatim) better watch out for Cruz. Earlier today I wrote about accusations from Ben Carson that Ted Cruz’s national co-chair Steve King misled caucus goers about the status of Ben Carson’s campaign. 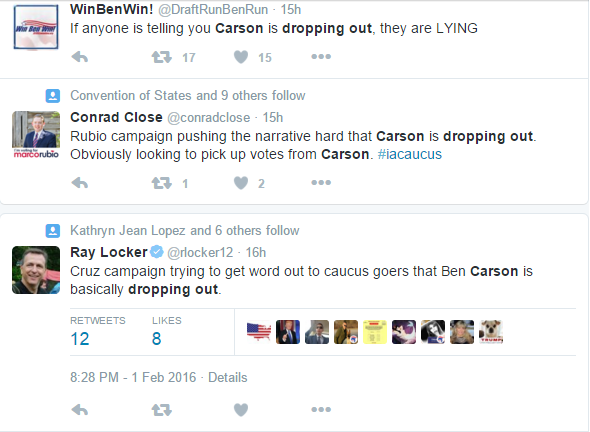 King tweeted prior to the start of the caucus that Carson appeared to be dropping out. In fact, Carson did not drop out and believes that the message from King and others in the Cruz camp compromised his Iowa results. Today, Cruz issued an apology but did not mention any consequences to staffers who misled voters. I have seen nothing from Marco Rubio’s camp. Alexandria, Virginia — February 2, 2016 – “Dr. Carson has accepted Senator Cruz’s apology issued earlier this afternoon,” said A. Larry Ross, Communications Director for Ben Carson for President 2016. “These ‘dirty tricks’ political tactics are part of the reason Dr. Carson got into this race and reflect the ‘Washington values’ of win at all cost — regardless of the damage to the country — which he is trying to change. This incident further demonstrates that we need an individual who is not a politician to lead and to heal our nation, not someone driven by ambition. UPDATE 2/3/16: The source of the story that Marco Rubio’s campaign told caucus goers that Ben Carson dropped out of the caucus now says his tweet was a mistake and based on other tweets he saw the night of the caucus. See information at the end of this post. This morning Ben Carson is calling on Ted Cruz to fire any staffers who told Iowa voters that Carson dropped out of the campaign. Carson announced Monday that he was going to Florida after the caucuses but later clarified that he needed to go home for fresh clothes and was not dropping out. According to tweets posted on Monday night, the rumor quickly circulated that Carson was suspending his campaign. Some of those tweets pointed to unnamed persons within the Cruz and Rubio campaigns as pushing the story that Carson was ending his campaign. Cruz campaign trying to get word out to caucus goers that Ben Carson is basically dropping out. Mr. Locker later told me via twitter that Steve King, Cruz’s national co-chair, was tweeting about Carson dropping out before the caucus event started. (Conrad Close has now deleted this tweet and said it was a mistake. Please see the updates below). It is unclear whether or not the campaigns knew Carson was going to get clothes or if they simply followed the media reports that Carson might be dropping out. UPDATE: Cruz apologized to Carson for not relaying a correction to the campaign workers Monday night. UPDATE: 2/3/16: Now Conrad Close says his tweet was a mistake. @1stbornAmerican The tweet was a mistake. Carson confused many people, myself included. And I don't work for the Rubio campaign in any way. I am unclear what Mr. Close saw on twitter which would have led him to believe Rubio’s campaign was running with the “Carson drops out” story. At least Rubio has better taste than Ted Cruz in historians. World magazine has the list of Rubio’s religious liberty advisory board members. Seriously, Thomas Kidd’s presence in this group makes me feel better about Rubio. Whatever one might think about any one person on this list, I appreciate the number of academics on the list. Now, let’s see if they really help inform his public policy proposals. In this months survey, the gap between evangelical insiders in World’s poll and GOP survey respondents remains wide on Donald Trump. No participant in World’s survey chose Trump as first choice for president. Ted Cruz gained ground and Marco Rubio remained first in the results. As I noted yesterday, it worries me that support for Cruz is rising. His views lean toward the Christian dominionist wing of religion and that is just one reason I believe he cannot appeal to independents and moderates. His governmental experience is very limited. He was elected to the Senate in 2013 and if elected will have been a Senator about as long as Barack Obama was before his first term. Republicans were rightly worried about Obama’s lack of experience in 2008. Cruz will face the same attacks from the left. In a time when fear seems to be prevailing emotion, Cruz’s thin resume’ does not inspire confidence. Rubio has a bit more experience in the Senate but much more previous experience in state politics. Of the two, Rubio seems more electable. While he may hold similar positions as Cruz, he articulates them more frequently in general political terms rather than apocalyptic religious ones. While I have not and probably won’t endorse a candidate until much later in the process, I know what concerns me and I know what I can’t endorse. Right now, Cruz falls into that category. Ted Cruz surged to second place among candidates for President in the survey. Marco Rubio continues to enjoy strong support from evangelicals surveyed with 44.8% of the respondents choosing Rubio as their first choice. Cruz increased to around 25% with the rest of the candidates lagging behind. Ben Carson’s stock fell and Donald Trump is near the bottom with apparently one respondent picking Trump. The World survey has made some enemies in recent weeks. Ann Coulter exploded about it because Trump isn’t doing better. World’s J.C. Derrick replied to her rant with some facts. Although Cruz supporters may take hope in this month’s results, I doubt they will have much more to celebrate. Said plainly, I believe a Cruz nomination assures a Hillary Clinton win. Cruz is not center-right as he implies he is; rather he is far right with supporters who want U.S. law to reflect Old Testament injunctions. He cannot back away from this and maintain any integrity with his base. In the general election, all of the pandering to the right wing fringe will be remembered. On the heels of a strong debate performance, Carly Fiorina has surged in a monthly poll of evangelical insiders published at World. Marco Rubio recorded a strong showing and is by far the candidate most participants believe can beat the Democratic nominee. I am interested in the issues which motivate these participants. For most participants, the top two are religious liberty and abortion. Relatively speaking, presidents have little to do with moving policy on these issues. While I would like someone who agrees with me on these matters, I prefer a president who is experienced and skilled in dealing with defense, foreign policy, and economic policy. Trump continues to do badly with this group. He has the highest negative ratings among Republicans. The survey participant quoted, Kay James, said Trump’s numbers are due to his policy positions being insufficiently biblical. One would have to have policy positions to be able to evaluate them, and mostly what I hear from Trump is that he wants to build a wall. I also think many evangelicals are turned off by Trump’s demeanor. Obamacare is way down the list of reasons to choose a president. There goes one of Ted Cruz’s wedge issues with this group. At about this time in 2007, Rudy Guiliani was supposed to run against Hillary Clinton. We have a long way to go.